Libraries In Churches: Oh Deer! This story out of Janesville Wisconsin should cause church librarians to review their insurance policies and emergency procedures. 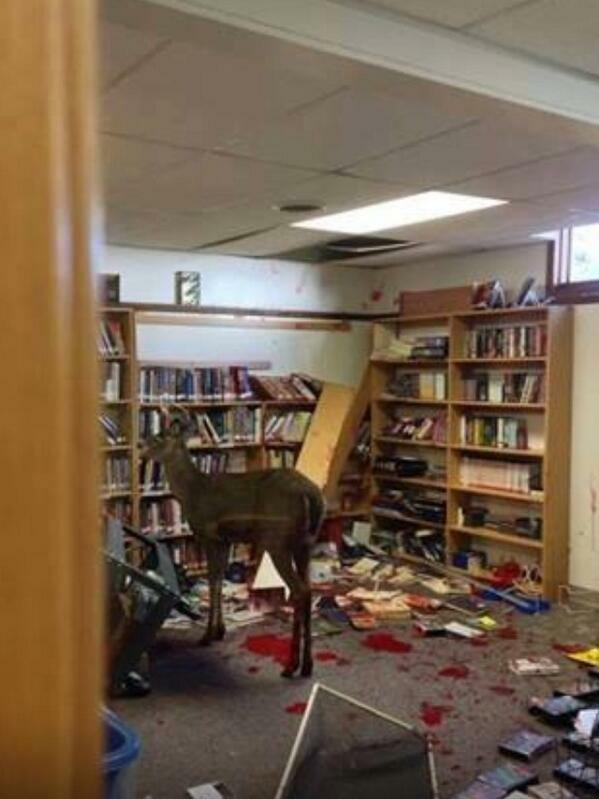 JANESVILLE, Wis.—A six-point buck smashed through a window and into the library in the basement of Bethel Baptist Church, over the weekend. The animal scrambled wildly to escape, as children attended Sunday school classes in nearby rooms.A man and his two daughters were checking out books when the animal crashed into the church library. All three quickly left and closed the door behind them.The deer was spurting blood as it crashed into bookshelves, trying to climb into the ceiling tiles to escape. "It really does look like a murder scene down there. It really was hurt pretty bad," Andrew Moffitt, a youth pastor at the church said. A marksman used a tranquilizer dart to stun the buck, allowing a veterinarian to euthanize it. Moffitt said the deer appeared too severely wounded to save. Other news reports indicate the church's insurance policy will cover costs for the damage incurred. Is your church library collection insured? Could your staff evacuate your library in the event of a sudden danger?